Bespoke gates made to order. Please contact store for details and pricing. If you want to create a memorable entrance, we’ve got the garden gate to fit the job. 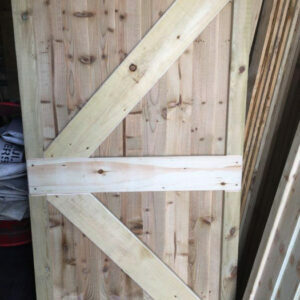 Keynsham Timber has a range of strong, sturdy gates to match our wooden fencing and posts, and if we don’t have one to suit your purpose, we’ll make a bespoke gate to order. The standard size of our gates featured here is 1.8m (h) x 0.9m (w), but because we build garden gates on site, we can make one to your specifications if you contact us for a quotation. 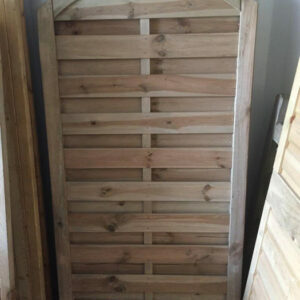 Our gates are carefully crafted by a carpenter using traditional techniques, and the best quality timber. Styles range from the extra-strong T & G Pedestrian Gate, perfect as a side-gate for securing your fenced garden when fastened with a bolt, to the elegant York/Devon gate, which is designed to enhance your garden landscaping. Our wooden gates are made of timber which has been treated with preservatives under pressure, which means they will have the longest possible life, protected against fungal decay and insect activity. 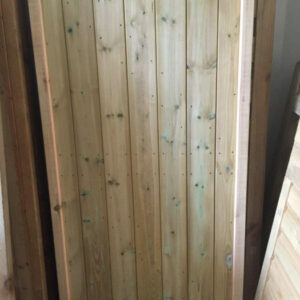 Whether you need a front garden gate, driveway gate, pedestrian gate, rear access gate or any other type of wooden gate, we can fulfil your requirements. 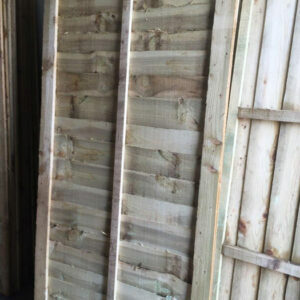 Our locally-based friendly team can arrange delivery of your chosen style of wooden garden gates to anywhere in the Bristol, Bath and Keynsham area, and beyond. Our Feather Edge gates are made on site and built to last. Construction of rebated 3×2 sides, 6×1 ledge and brace and comes complete with feather edge cladding to front, capping and gravel board. All materials used are pressure treated. Regular price is for a standard size gate measuring 1.8m (h) x 0.9m (w). Bespoke sizes can be quoted for. An economy gate that will match in with existing lap panel fencing. Pressure treated Green. Excellent value for money. Our sturdiest Gate! Our T&G gates are made on site and built to last. Construction of rebated 3×2 sides, T&G ledge and brace and comes complete with T&G cladding to front, capping and gravel board. All materials used are pressure treated. Regular price is for a standard size gate measuring 1.8m (h) x 0.9m (w). Bespoke sizes can be quoted for. Our TG&V gates are made on site and built to last. Construction of rebated 3×2 sides, T&G ledge and brace and comes complete with TG&V cladding to front, capping and gravel board. All materials used are pressure treated. Regular price is for a standard size gate measuring 1.8m (h) x 0.9m (w). Bespoke sizes can be quoted for. Manufactured in Europe from selected softwood and pressure treated green. These gates are stylish and elegant and would be a welcome addition in any landscaped garden.